8 plants suitable for growing over and around paving. 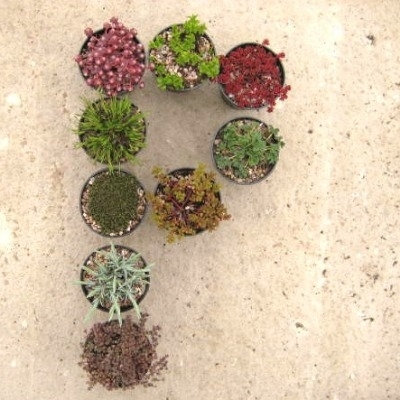 Our selection of 8 different alpines suitable for growing in or around paving. Whether your paving is stone, concrete, or gravel, these low-growing, spreading plants will creep or wander over the surface, visually breaking up any hard, straight edges. We normally include some Thymes in our collections - these are robust enough to be walked upon (occasionally!) and will release an attractive scent from their crushed leaves. Most of the plants listed below are vigorous enough to withstand occasional, accidental foot traffic around the edges without too much damage. Other varieties will creep underground and wander to fill and grow in the spaces between stones or slabs. If planting between paving slabs it is usually necessary to prepare a good-sized planting hole filled with good soil - this is important. We will send the best plants available at the time of ordering and all will be individually named and labelled. Image is for illustration only - there are 9 plants in that 'P' shape! Thymus (thymes) - most, but especially 'Bressingham', 'Doone Valley', Pink Chintz', polytrichus brittanicus, 'Purple Beauty', 'Ruby Glow', 'Russetings'. These are some obvious examples but many alpine plants might be suitable and all are low-growing. For example, the Helianthemums (Rock Roses) will, where space allows, spread to form a wide mound; they will grow over the paving rather than run along the gaps between paving stones. Plants which will creep along gaps are in bold.